Conversational commerce is the hottest new trend in marketing. Everywhere you turn for advice you’ll see people explaining how services like Facebook Messenger are the future of effective ecommerce marketing. Thing is, whilst there’s a tonne of information on the incredible results Messenger and a conversational approach to marketing can bring your business, there’s very little on how this actually works. I wrote a piece recently here on the Recart blog which explained the fundamentals of conversational commerce, but I still think further explanation is needed. When I say further explanation, I’m not talking about the generic marketing content you’re used to. The tips and tricks of how a business increased conversion rate by x% or generated $x more revenue. No, what I want to do is go right back to the basics of conversational commerce. We’re going to run through exactly how an effective conversational commerce marketing approach works in ecommerce, but from the perspective of your customers. To help us demonstrate exactly what you and your customers can expect with Facebook Messenger, we’ve enlisted the wonderful, imaginary customer, Lucy. She browses your site for a couple of minutes before stumbling across a pair she likes. She likes this pair, but she’s not yet sure if she wants to buy them. She adds the headphones to her cart, effectively saving them for later. 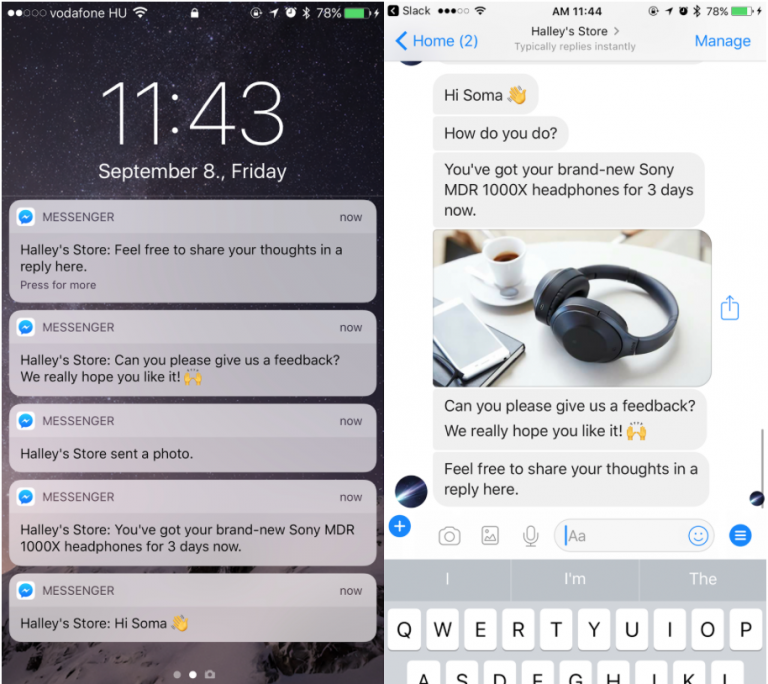 And this is the first instance where conversational commerce changes the traditional ecommerce purchase journey. Instead of simply saving the cart, your store serves Lucy a short notification asking if she’s OK with you keeping her updated via Messenger. It looks something like the below. That little tick box below the add to cart button gives you permission to follow up with Lucy. The collection of Lucy’s permission is going to be needed because, just after adding those headphones to her cart, she’s called into an impromptu meeting. Because she’s been distracted, she forgets about the purchase and abandons her cart. When 5 o’clock rolls around, Lucy is too tired to think of anything but getting home and relaxing in front of the TV. 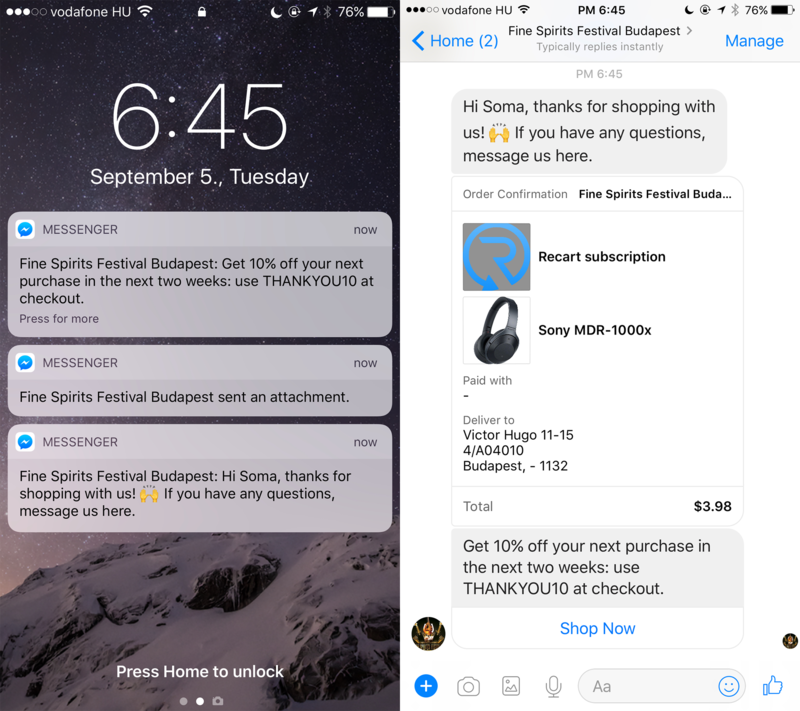 This is the second instance where conversational commerce through Facebook Messenger changes the game. In traditional ecommerce marketing, Lucy would receive an email notifying her of her cart. That email would often fall into the spam folder, or go completely unnoticed until the following day. But thanks to Messenger and the permission you collected, you’re able to send Lucy an actual phone notification. One which forces the screen to light up and makes the phone vibrate and “ding”. Lucy picks up her phone and sees a message from your store. A simple, friendly reminder she’s left items in her cart, a message which perhaps includes an incentive. When she opens Facebook Messenger, she see’s the full message including some friendly emojis and a great picture of the product. Lucy reads the message, clicks on the link and is instantly back at her checkout page. All of this has been completed without leaving the Facebook Messenger app. No new tabs need be opened, no navigating to the spam folder to see if there’s any money off incentives, no difficulty in following the next step. A simplified, streamlined method of sending and facilitating cart abandonment messages. Lucy is back at her checkout and ready to hit “buy”, but there’s a problem. Lucy’s heading to a conference on the West Coast this weekend and wanted the headphones for the flight. The final hurdle stopping her from converting is the thought that the headphones won’t arrive in time. To figure out the regular shipping time, Lucy replies to the abandoned cart message with a question about delivery estimates. If you’ve got full-time customer service staff monitoring your store’s chat, you’d be able to reply instantly. If not, you can set up a chatbot that has pre-written responses triggered by certain keywords. 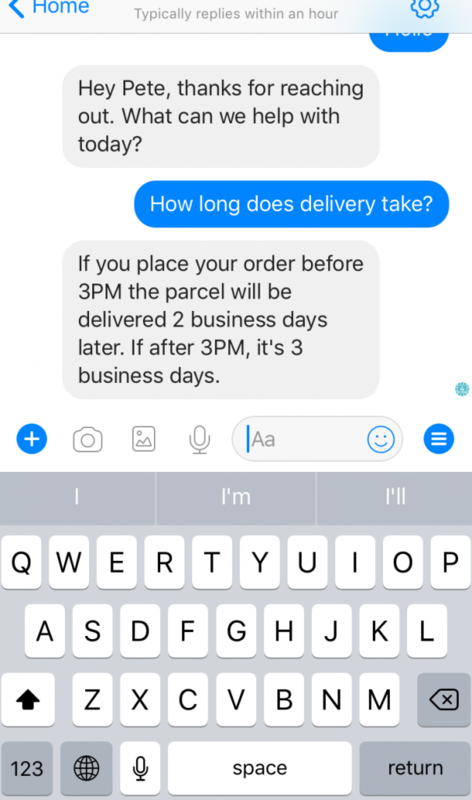 For example, your store’s chat bot picks up the keyword “delivery” and replies; not with a generic “your business is important to us, we aim to respond within 24 hours” message, but with a response relevant to the keyword. The bot outlines the delivery process which shows lucy that, if she orders within the next 2 hours, she’ll get the headphones in time. The final hurdle that prevented Lucy from purchasing from you has been obliterated. She continues to make the purchase knowing that her headphones will arrive in time for her flight. But just as Lucy puts the phone down, it buzzes once more. She picks it up and sees another notification from your store. 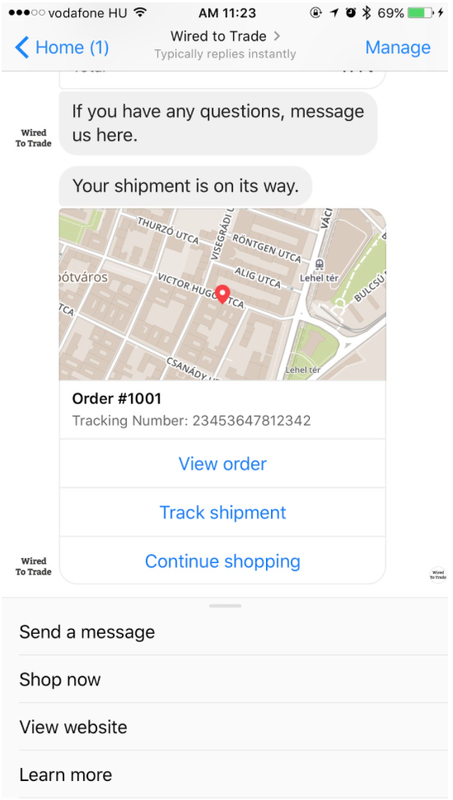 This one is the receipt, a confirmation of delivery date, and a discount code for her next purchase. Lucy not only knows that her purchase has gone through the system, she also knows it should arrive on time and has an incentive to return for another purchase. She goes to bed that night happy with her new purchase and looking forward to playing with her new headphones. The following day, her phone buzzes once more to let her know that her parcel has just been dispatched. The message also lets Lucy know that she should expect to receive the parcel the following day. 24 hours later, she gets the final notification letting her know that her parcel has been delivered and is waiting for her on her porch. That weekend Lucy is on a plane to her conference sporting her awesome new headphones. She uses them every day during the conference and on the flight back home. Over the next two weeks, she’s uses the headphones almost daily. And then, out of the blue her phone buzzes again. She picks it up to see a notification form your store. The message is a quick question to see how Lucy is liking the purchase and, if she’s enjoying it, asking if she’d be happy to leave a quick rating and review. Straight from her Messenger app, Lucy clicks on five stars and writes a couple of lines detailing how amazing the headphones are. After thanking Lucy, you apply that rating and testimonial to your product page as valuable social proof for other users. Being able to manage your cart, converse with a store, and complete your purchase from a single location is something not yet seen in ecommerce. Pulling all that communication into a single channel is soon going to be the bare minimum ecommerce brads are expected to provide. If you’re not already making use of Messenger in your marketing, now is the time to start. Get on board whilst the going is slow or you risk finding yourself behind the curve and struggling to catch up with your competitors. 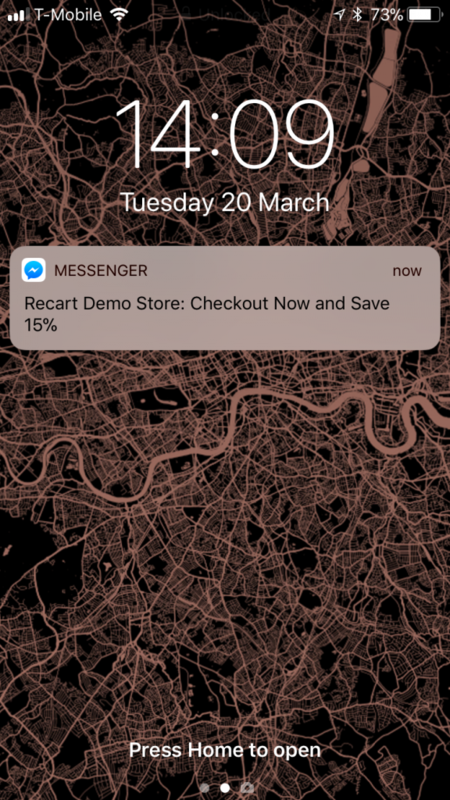 You can get your Messenger marketing started right now by signing up for a trial Recart account. There’s a bunch of push button solutions that will help you get your Messenger campaigns up and running before the end of the day.